The energy agreement allows Trinidad and Tobago to process Venezuelan natural gas. August 25 (teleSUR) The governments of Trinidad and Tobago and the Bolivarian Republic of Venezuela signed an agreement Saturday that allows the Caribbean island to process natural gas from Venezuela’s Dragon field. 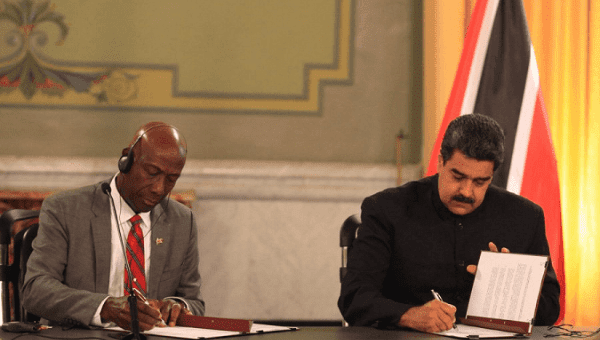 The agreement was signed by the Prime Minister of Trinidad and Tobago Dr. Keith Rowley and Venezuelan President Nicolas Maduro in a high-level diplomatic event held in Caracas. After the signing, Rowley expressed gratitude to his ministers who brokered the deal along with Venezuelan authorities for two years to reach an agreement. “Venezuela’s resources of natural gas have never been an input but after today, Venezuela’s gas will come to the international market to be monetized for the benefit of the people of Venezuela, and with that being so, the sky is the limit,” Rowley said. Maduro also thanked Rowley and his delegation for the effort put into the agreement and highlighted shared interests. “We share a very important space in the Caribbean, our Caribbean. Today we have signed a very important document that will allow the production of physical and monetary wealth to the peoples of Venezuela and Trinidad and Tobago from joint gas deposits… Transforming gas from joint deposits in a peaceful way, based on cooperation and international law… It’s unique,” Maduro celebrated. Venezuela used the occasion to highlight the importance to maintain respectful relations between neighboring countries. “Let’s overcome the old colonialisms, the old slavery. The old and the new,” he said. Maduro also urged the two nations to improve and increase trade. “I’ve instructed the governors to go to T&T and establish trade so that Trinidad and Tobago can become a great provider of the good that the people of Venezuela need… We also have good quality products that you would like,” Maduro said. National authorities signed the agreement, representatives of T&T’s National Gas Company, Venezuela’s state oil company, PDVSA, and Shell, the multinational energy giant that holds the rights to drill the Dragon field. Shell’s pipelines will be used to transport Dragon’s gas to the Hibiscus platform off the north-west coast of Trinidad, only 18 kilometers away from the gas field. The Trinidad and Tobago government and Shell jointly own hibiscus.